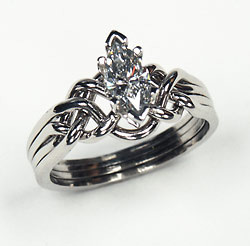 The Celtic-inspired marquise diamond puzzle ring is an engagement ring like no other. A genuine puzzle ring that really comes apart and goes back together, it is a hand-woven work of art that she will love to wear and to show off to her friends and loved ones. 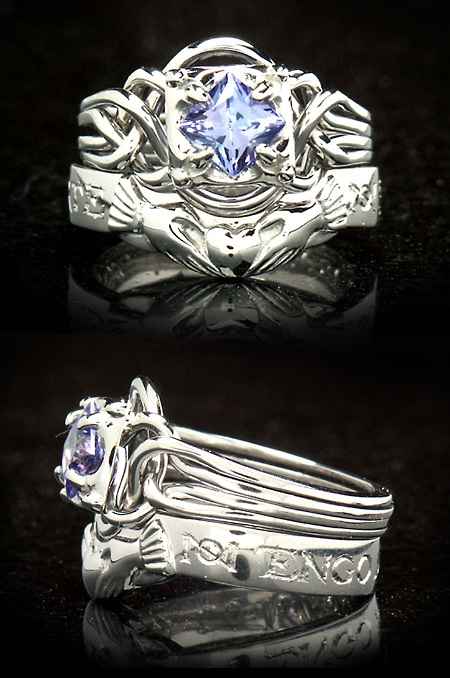 Shown here is the puzzle ring with an open weave. This weave creates a wider ring with sides that make a “V” or “U” shape. 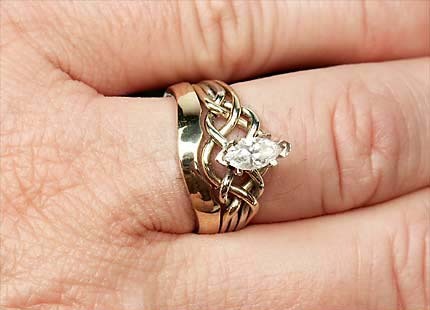 Usually this ring is worn by itself as a dual engagement-wedding ring or as a set with a custom companion (shadow) band as shown below in yellow gold. Shadow bands can have a design of any kind on the outside and your special words on the inside. A number of puzzle ring/shadow band combinations are pictured below. Follow links to obtain more detail. This post represents only a few of the infinite design possibilities for puzzle rings and shadow bands. Unique bridal sets: Emerald Marquise puzzle ring with 2mm shadow band in palladium. 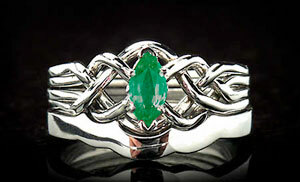 Please see more ideas for celtic bridal sets with custom puzzle rings and custom-fit shadow companion bands. And feel free to call Mandira toll free at 866 573 7831 for your free, no-obligation consultation.